As we move into the summer season, it's not all about toes in the sand, swimsuits and basking in the hot sun. Summer also means a new crop of seasonal specialties and there's no better place to get a taste of summer than at Morton's the Steakhouse. A new four-course menu includes a lovely sampling of summer flavor. Proscuitto wrapped mozzarella. Shrimp scampi capellini. Honey-chili glazed salmon. The special four course meal is only here through June 26. It's $49 for the four course feast. If you aren't familiar with Morton's, the premium steakhouse opened its first location in Chicago in 1978. It has now grown to have over 70 locations around the world. Along with its two Chicago locations (including the original one), you'll find Morton's the Steakhouse in Rosemont, Naperville, Northbrook and Schaumburg. It is part of Landry's, Inc. Restaurant Group. 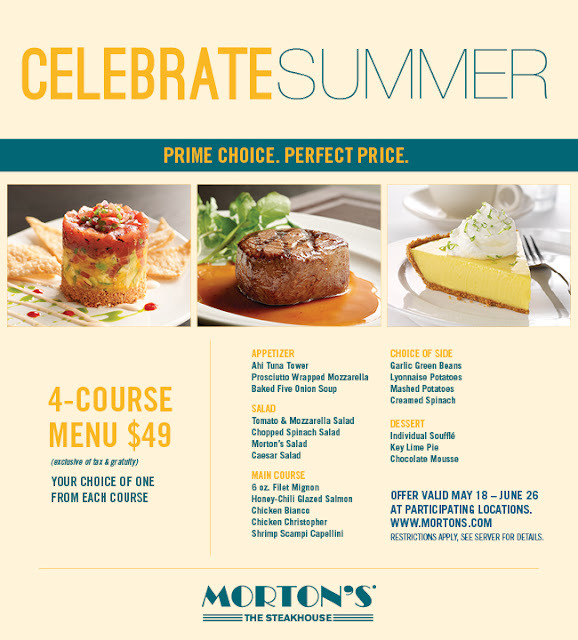 Go to Mortons.com for more information.